For any new readers: HI and thanks for stopping by and checking out my little slice of the blogosphere! 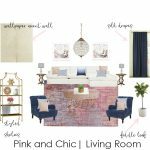 I hope you find something to inspire you to restyle your own space! 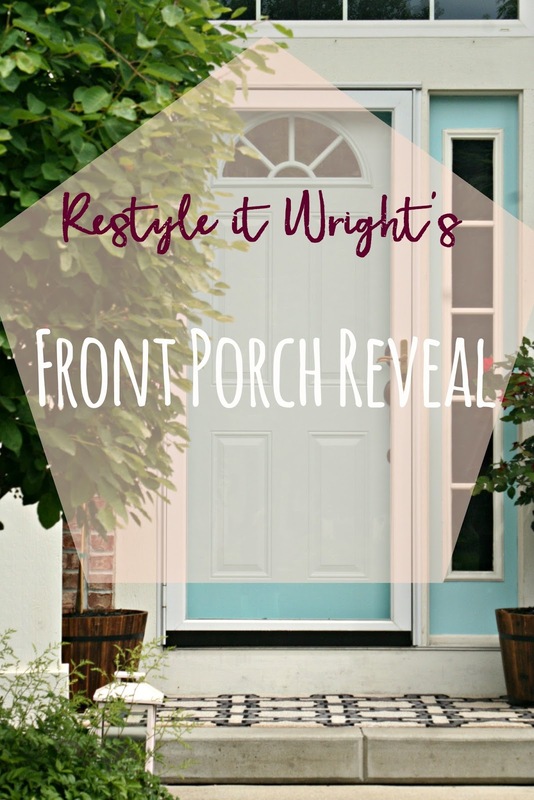 I’m here today to share our Front Porch Reveal! Yayyy!!! 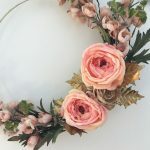 If you follow me on Instagram then you’ve seen lots of sneak peaks along the way, but today I want to dive into all the fun details. I’ve always wanted to have a front porch to sit on and sip cocktails and coffee, but it wasn’t in the cards with this house. Don’t get me wrong, it’s a beautiful front porch…just not the sittin’ kind. So I had to rethink a plan on how to make this front porch inviting. My vision for the board was to have a chic and welcoming entry that made a statement. I live in a subdivision of like houses and since I’m anything but cookie cutter, my house had to stand out. 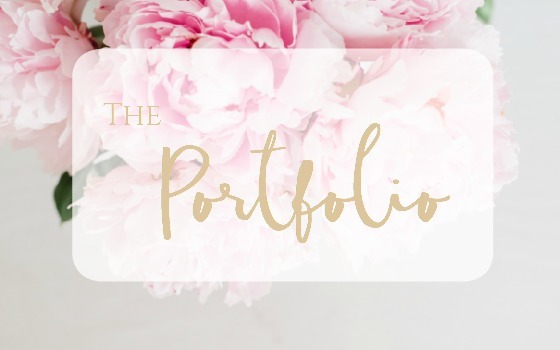 So, I started this makeover just like I do with most makeovers and used Polyvore to create a mood board. 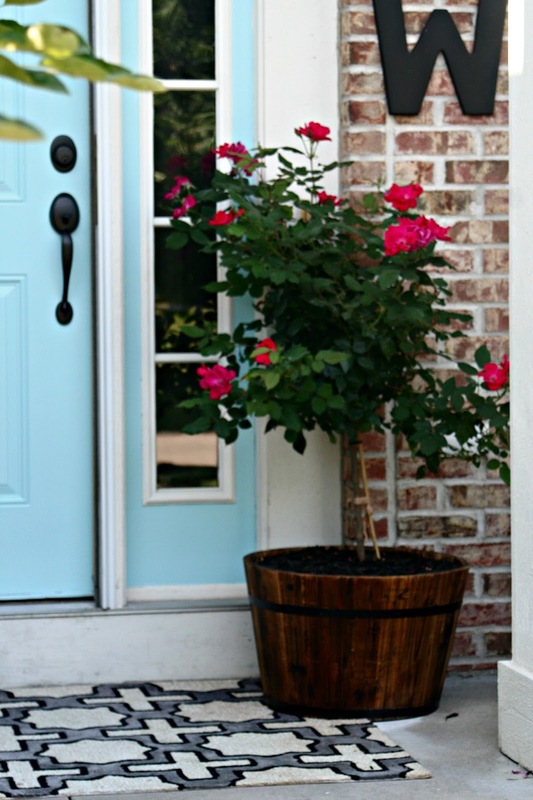 To kick off this front porch restyle, the first priority was to get those Knock Out Rose Trees! Once Spring hit, I stalked our local nurseries like it was my job until they came in. They are popular due to the cost (inexpensive) and heartiness of the tree and they tend to sell out quickly. So if you’re in the market for one…you’ve been warned! I’ve had them for a few months now and they have definitely lived up to their reputation. I’m the opposite of a green thumb (so, black thumb?) and I haven’t managed to kill them yet! Let’s talk about the pots. I realllly wanted those gold posts from the mood board but at $80 a pop I just couldn’t swing it. So I opted for these wood barrel types that I got for around $20 each at Lowe’s. Even though my heart was set on gold, I’m enjoying these pots and the overall look they bring to the porch. Plus, I couldn’t beat the $120 savings. The next project on the list was to purchase that gorgeous rug from the mood board. 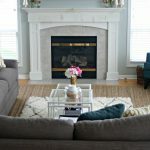 I’m a huge fan of Rugs USA and it’s where I buy 90% of my rugs. They almost always have 70% off sales and this time was no exception. I scored that puppy for $59 and it’s an indoor/outdoor rug so if it gets wet no biggie. It’s no secret I love rugs as much as the air I breathe (ok, maybe thats an exaggeration) but seriously you guys…I love them. So, I HAD to have one on the front porch and this beauty stole my heart. You can find your very own here and it’s still on sale! 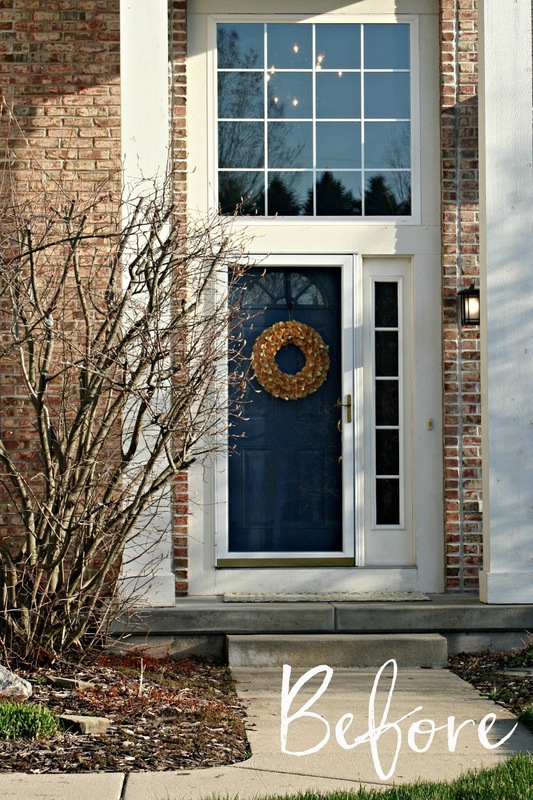 Once those two items were checked off the list it was time to work on some outdoor details before starting the door. I did a quick spruce up of some mirrors I had on hand by spraying one of them gold. They are a plastic frame and not necessarily intended for the outdoors, but given there is an awning covering the brick there I figured they would be okay. So far, so good! I attached them with this 3M outdoor adhesive tape and it’s worked great! Another decorative element I added was the letter “W”, It was the quickest, easiest DIY ever! I purchased a wooden letter from my local craft store along with some craft paint (I chose Martha Stewart Beetle Black). I had a sponge brush on hand and applied two coats onto the letter and voila! Instant outdoor decor! I used the 3M outdoor tape to secure this to the brick just like the mirrors. 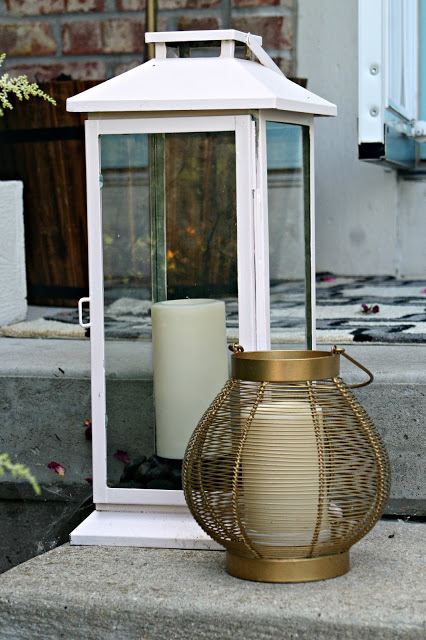 I also took the same gold spray paint I used for the mirror and gave this outdoor lantern a quick coat. Instant Glam! The tall lantern behind it was originally silver, but I used a sample can of paint I had on hand and gave it a makeover. Super Simple. 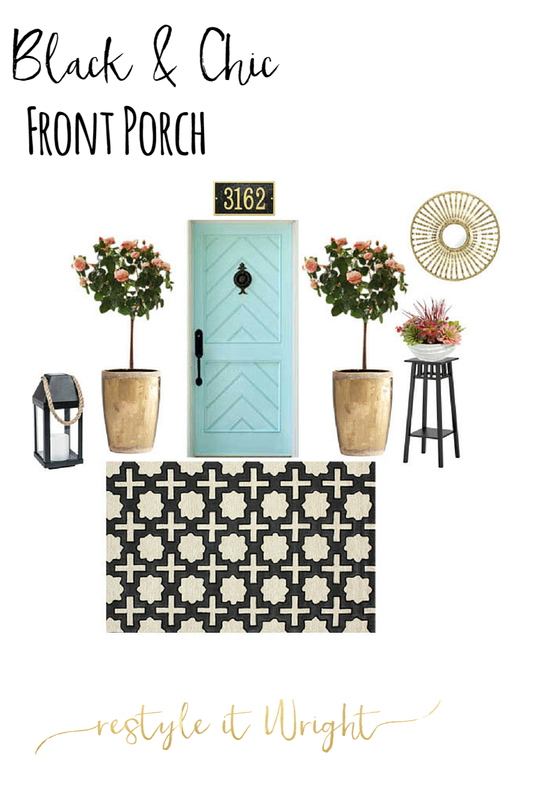 The piece de resistance has to be THAT FRONT DOOR though. It’s been the most nerve racking DIY yet. 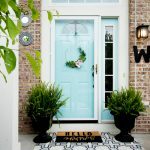 I covered the whole ordeal from stripping the front door to priming and painting so if you haven’t been through the saga with me you’ll have to check it out. 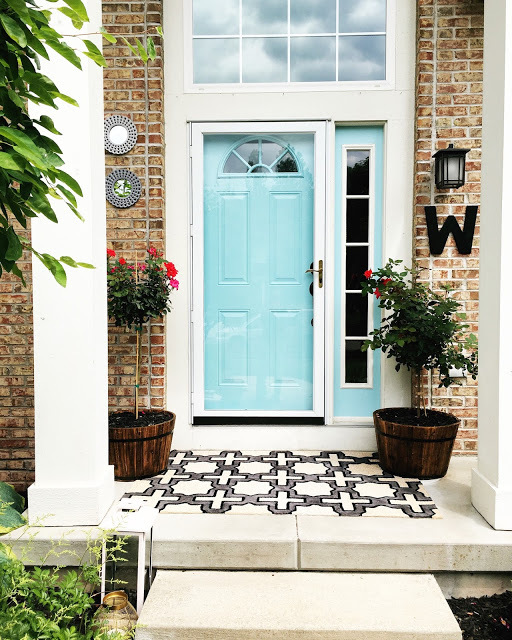 There are some good tips in there if you’re feeling like switching up your own front door color (which I always encourage). 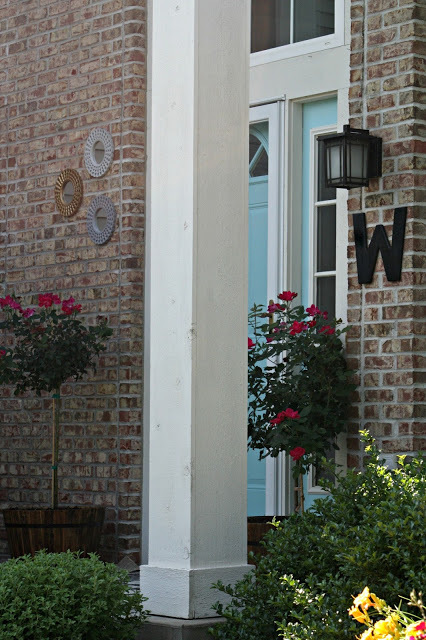 I still want to add a few more touches like a custom “Welcome” sign and some new house numbers but those are just details I still need to work out. Until then…here’s a before and after. I’d say its a great step in the right direction! We’ve been here almost a year now (hard to believe) so this was the perfect ‘kick off summer’ restyle. I have to say though, secretly, I still kinda want a pink door. 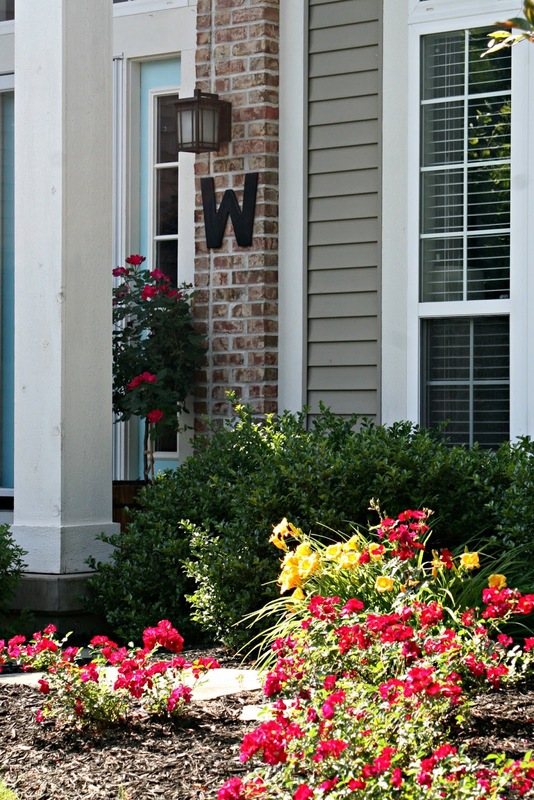 How have you been sprucing up your outdoors?! Leave me a link! 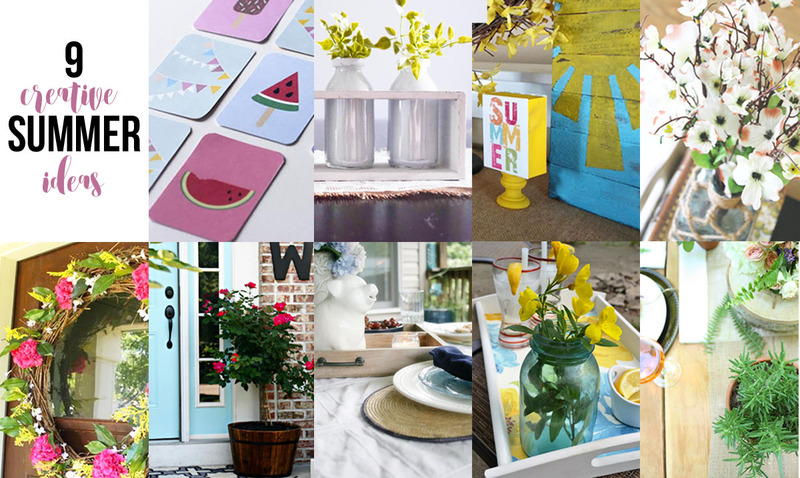 I’d love to check out some of your summer projects! 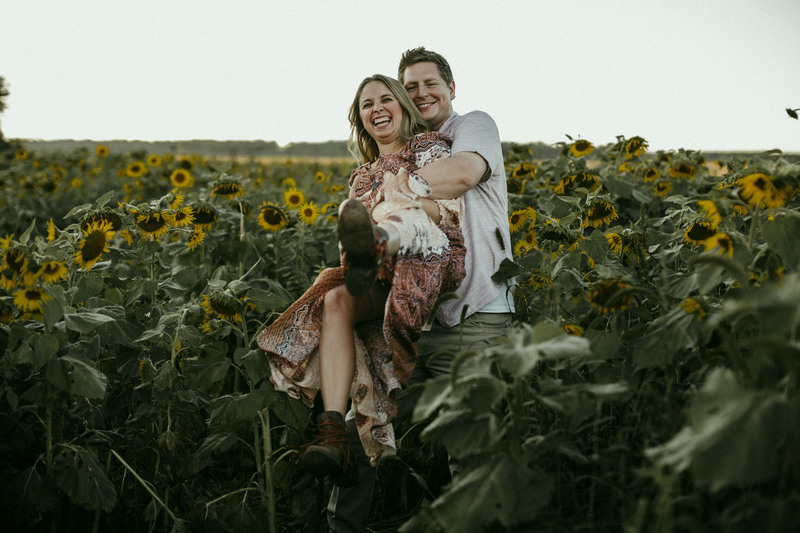 Please check out the other links in this Summer Blog Hop! 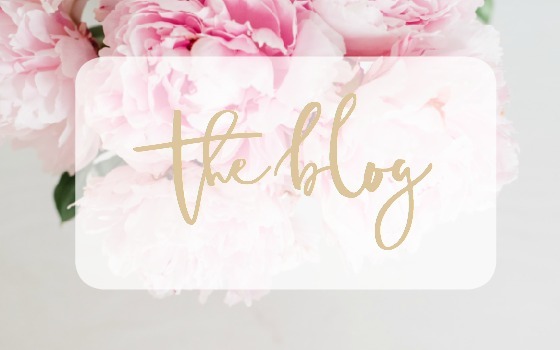 They are all great blogs to follow! 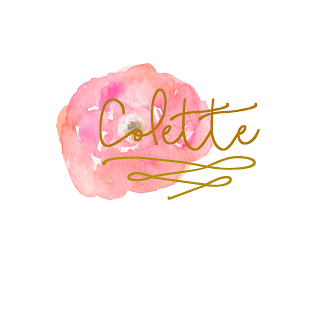 It turned out great, Colette! I've told you I love that rug 🙂 but I also thing the rose bushes are a great choice. The pop of pink is really nice, and their height is great for the overall look. YES! 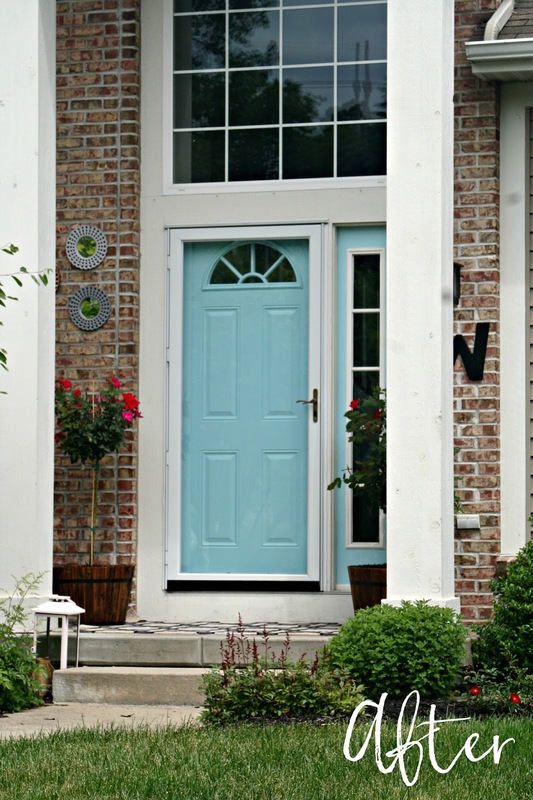 A PINK DOOR WOULD BE SO CUTE!!! I love your summer restyling!! Great job!! I love how the reveal turned out. We have knock out roses, but not as a cute tree like that! They look so sweet and elegant in the buckets, even if they're not gold. I love all the finishing touches that bring it together. And the rug is perfect! Great work!! I love your reveal! It turned out so nice and I think you have just the right amount of color to make everything pop. We have a sitting kind of porch (which we love), but it definitely needs some love and color. Thanks for the inspiration! I love the mix with the pink and blue! It gives such a good contrast but if you change the door too soft pink, would your porch look too pink….I got no idea. I love the W, and the spray painted lanterns, and everything about this space. Oh, I may have to get some of this kind of outdoor tape to hang stuff – I had not know about it!! Me toooooo Thanks Lora! 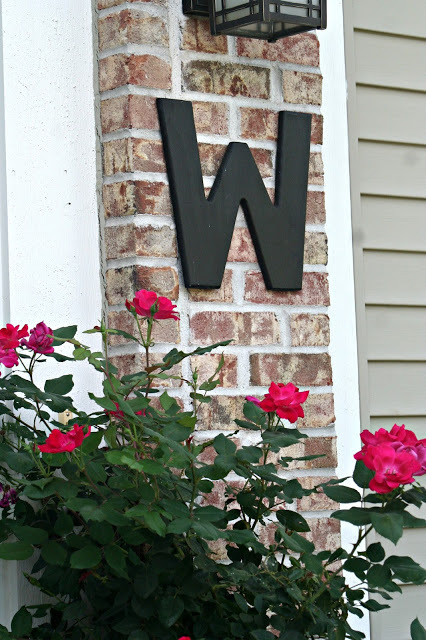 Those rose bushes are the bomb.com. Thank you Valerie! I haven't fully committed to the color…pink may still make its way in! Thanks so much Sarah! Yah the knock out rose tree is versatile…plant in the ground or a pot and just bring it in the garage in the winter…we'll see how they hold up! Thanks Alina! Yah, spray alllll the things gold! Thanks Shani!! I'm glad I inspired you 🙂 Embrace the color! 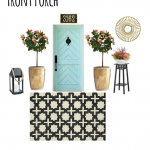 I love black and white geometric patterns with blue! 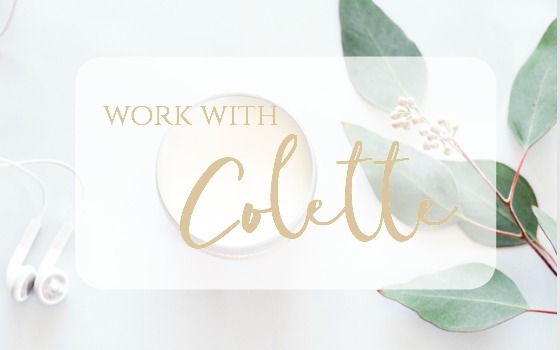 Looks great together, Colette! I'm writing down the rose trees on my wish list for next year as I'm sure they're all gone by this point!